Every year when a new volume for Digital Art Maters comes out, I would use the thesarus to find a word that's synonymous with awesome. Soon, I'll have to repeat the adjectives. The 9th volume features another 50 artists and their amazing digital artworks complete with descriptions and screenshots. Altogether, there are over 600 beautiful images included in the five sections, namely Sci-Fi, Scenes, Fantasy, Characters and Cartoons. If you've been collecting the previous volumes, you already know what to expect. If you're new, you might be inspired to get the earlier volumes after looking through this. The quality of the work featured is phenomenal, from the concept to the execution. You should definitely check out the websites of all the artists in th ebook. There are 288 pages. 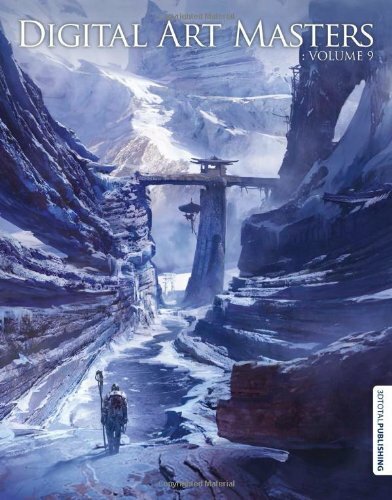 For the first time, I found out that there's actually a hardcover available as well but it's only sold at 3DTotal's online shop. The paperback edition is available where artbooks are sold. Great book. Highly recommended as usual.